Drying of freshly harvested ginger and turmeric to reduce their moisture content and thereby preventing the loss in quality and quantity of cash-crops during storage. Moisture reduction from 85-90% to less than 10% in 4-5 hrs. 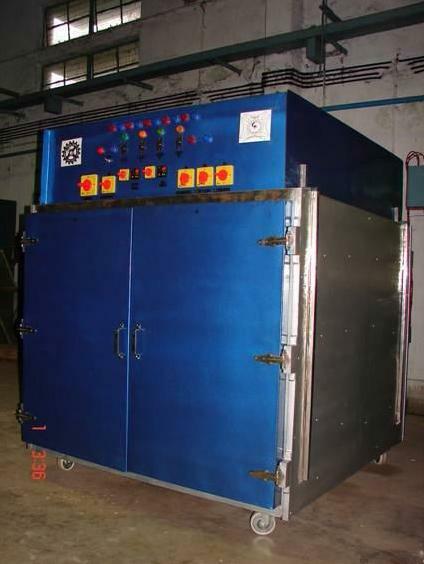 Available general purpose dryers have been found to take about 15 hours for drying of ginger / turmeric slices, which consumes more energy, and also results in degradation of the quality of the product due to mould growth. Thus, they are not at all suitable for processing of high moisture content agro-crops like ginger/turmeric. The developed dryer enables faster drying (4-5 hrs.) with more uniform product quality. Reduces human drudgery in open air sun drying, which causes quality degradation of the crop as well. Status of Commercialization: Technology transferred on non-exclusive basis with one time license fee and royalty on the sold items using the technology. Copyright application filed on 13-04-2009; Reference No: IPMG / Copyright / 2009 / 01. Application filed for Indian Patent on 09-07-2009; Reference No. 0090NF2009. Level/Scale of Development: Prototype developed, successfully tested and technological knowhow transferred on non-exclusive basis.